New Year’s has finally arrived and at Hertz Furniture we made a resolution to start off the year by giving back to some of our favorite heroes, classroom teachers! We are giving away 1 Kore Executive Stool and 4 Kore Wobble Chairs to whomever has the best ending to this sentence. Tell us how you will be a better teacher in 2017. Why? 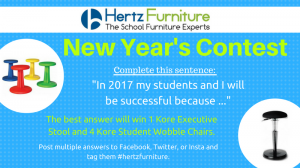 Because doing so can win you 1 Kore Executive Stool and 4 Kore Student Wobble Chairs for your students! Use your brand new Kore stool and wobble chairs to focus your most active students, as a center for a collaborative activity or as a prize for well-behaving students. All you need to do is post the end of the sentence to your Facebook, Twitter, orInstagram and tag #hertzfurniture. It’s really simple, make a new year’s resolution, write it on your social, add tag #hertzfurniture and you can win. More good news is that every social channel you post to will be counted as another entry. So, for example, if you post to Twitter and then again to Facebook that would be counted as 2 entries. Go do it. Now. Contest Sponsored by Kore. No purchase necessary. Void where prohibited. Contest open to residents of the United States only. If the winner does not respond to winner notification in 24 hours, we reserve the right to choose a new winner.